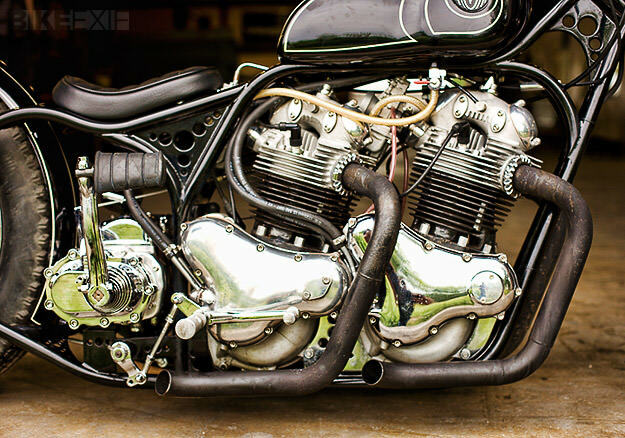 I can never ever get enough of these cool double engined machines and wanted to share some with you this month so here is a very cool double Norton set up that I am sure you will dig as much as me. Some motorcycles seem to be sacrosanct when it comes to customizing, while others are fair game. So you see quite a few Triumph Trophy customs, and not many Nortons. But Jason Kidd, owner of Flyrite Choppers, has no qualms: his extraordinary ‘Double Trouble’ custom has not one, but two 1960s Norton Atlas 750 twins nestling in the frame. (By my calculation, that means an output of 110bhp or more.) It could have been a monstrosity, but the result is clean, classy and attention grabbing. And given that it’s hard enough to get a single-engined bike looking good, this is quite an achievement. Flyrite’s down-to-earth philosophy no doubt plays a part—as befits an NHSTA-licensed manufacturer, their bikes are soundly engineered: on Double Trouble, there’s a place for everything, and everything is in its place. “At Flyrite Choppers we build bikes the way they used to be: basic, bare bones, wrench-on-it-yourself for the real motorcycle rider. 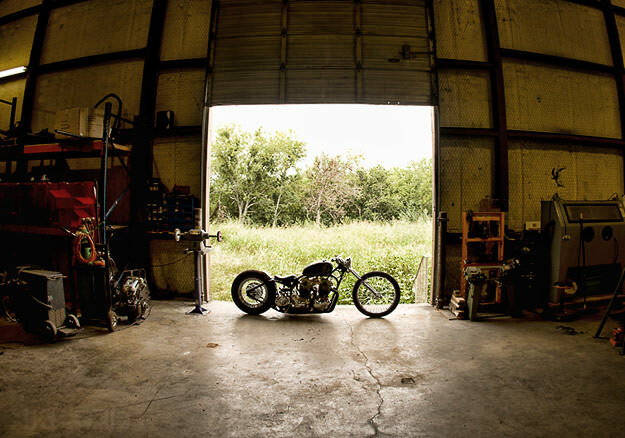 We have basic principles that we adhere to when building a bike.” Despite taking top honors at last year’s Harvest Classic European and Vintage Motorcycle Rally in Luckenbach, there are surprisingly few images of Double Trouble around—so we have Texas-based photographer Bill Fraser to thank for sending these in. More shots after the tech sheet below. Builder: Ken Armann Restoration in Santa Clara, CA. 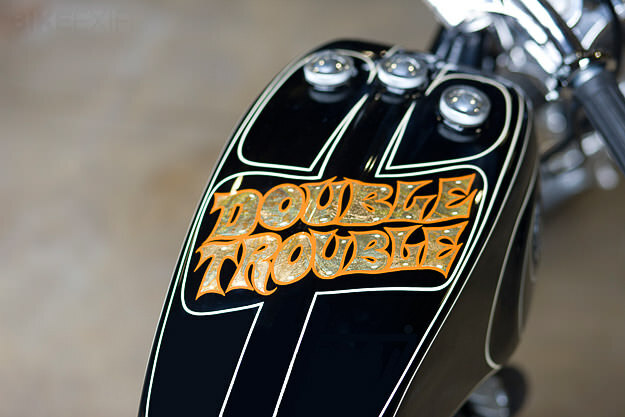 Classic pin lines on a cool tank sets this bike off into the realms of Ed Roth and Von Dutch. 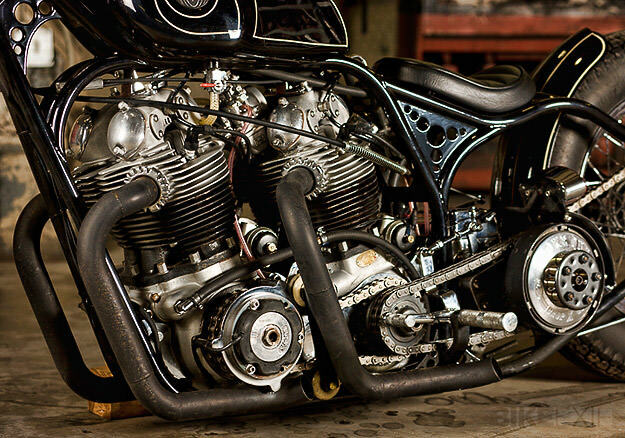 I really love the look of these Siamese motors. 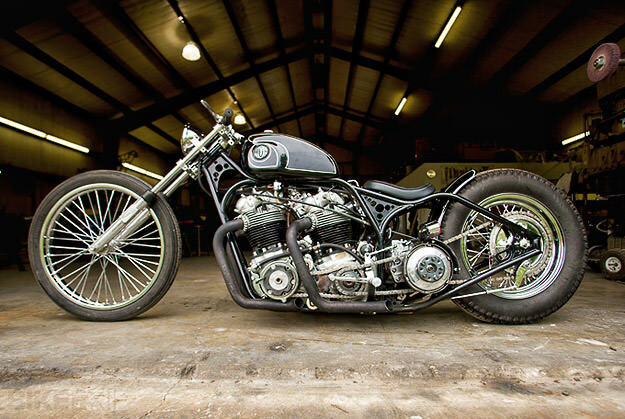 This entry was posted in Blog and tagged 1/4 miler, brat, british iron, cafe racer, chopper, custom, double engine, drag bike, dragster, nhra, norton, old school, ton up.